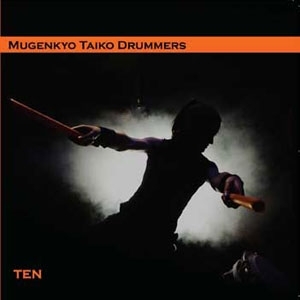 Top / CD / Mugenkyo Taiko Drummers CD - "Ten"
Mugenkyo Taiko Drummers CD - "Ten"
Mugenkyo's second CD, recorded in our tenth anniversary year. Big booming taiko stompers contrast with bamboo flute, didgeridoo, bells & voice. Includes the high-energy "Phoenix", Mackie's big drum solo "Odaiko", and for the first time ever, a dub taiko track called "Declaration of Rhythm"...plus a bonus CD-ROM of video clips of the show. Mugenkyo Taiko Drummers CD - "Era"
Mugenkyo Taiko Drummers CD - "Eternal Return"